The Golden Retriever Husky mix is also known as the Goberian, or the Golden Husky. This mix is increasingly popular in a world that is starting to truly appreciate mixed breed dogs. Let’s take a look at what makes this mix stand out! Our readers’ most popular and frequently asked questions about the Golden Retriever Husky mix. How much is a Goberian puppy? Where can I find a Golden Retriever Husky mix? How big do Golden Retriever Husky mixes get? If you don’t see your question addressed here or in the rest of the article, make sure to leave us a comment! Popularity: According to the AKC, Golden Retrievers are the third most popular breed in the US, and Huskies are the twelfth. Weight: 35 to 75 pounds. Do Golden Retriever Husky mixes make good family pets? If you see any subject that particularly catches your eye, go ahead and use the link to jump to it. Otherwise, read on for all the pertinent information about the Golden Retriever Husky mix! In this article, we are going to examine an increasingly popular cross breed, the Golden Retriever Husky mix. Also known as the Goberian, the Husky Golden Retriever has become increasingly popular over the past several years. This is not surprising when you consider how popular the two parent breeds are. Of course, all cross breeds face some controversy. Purebred dog enthusiasts often claim that mixed breed dogs are unethically bred and face health problems compared to purebred dogs. They argue that a pedigree is the best way to ensure that you’re getting a quality dog. Meanwhile, lovers of crossbreeds point to the predictable health problems faced by most purebreds. So who is correct? For a dog to be purebred, both of its parents must be on the same breed list of dogs who meet a certain standard and whose parents, in turn, were also on the list and so forth down the line. This lack of genetic diversity leads to worse all-round health. Crossbreeds have fewer of these problems because their DNA comes from two dogs with more genetic differences. They are less likely to inherit unhealthy genes. However, we’re here to talk about one particular crossbreed, the Husky and Golden Retriever mix. We don’t know who first decided to breed a Golden Retriever mixed with a Husky. However, we do know that this crossbreed started appearing in the early 2000s. The two parent breeds, on the other hand, have long histories. The Siberian Husky is one of the few dog breeds with truly ancient origins, according to a 2004 study. The breed originated from the Chukchi people of far eastern Russia, who relied on its work as a sled dog to hunt over wider areas. Russian fur traders introduced Huskies to Alaska in the early 1900s for use by gold miners and arctic explorers. The Husky quickly gained popularity among dog sled racers. They were smaller, faster, and more enduring than the region’s sled dogs, which were bred to pull freight. The Golden Retriever was first bred in Scotland in the mid-1800s. Fowl hunting was becoming increasingly popular among the wealthy. However, they needed a Retriever that could do the job both on land and in the water. To address this need, Dudley Marjoribanks crossbred Tweed Water Spaniels and existing Retriever breeds. The Irish Setter, St. John’s Water Dog, and light-colored Bloodhounds were also mixed in as the line progressed. This all led to the Golden Retriever we know today. 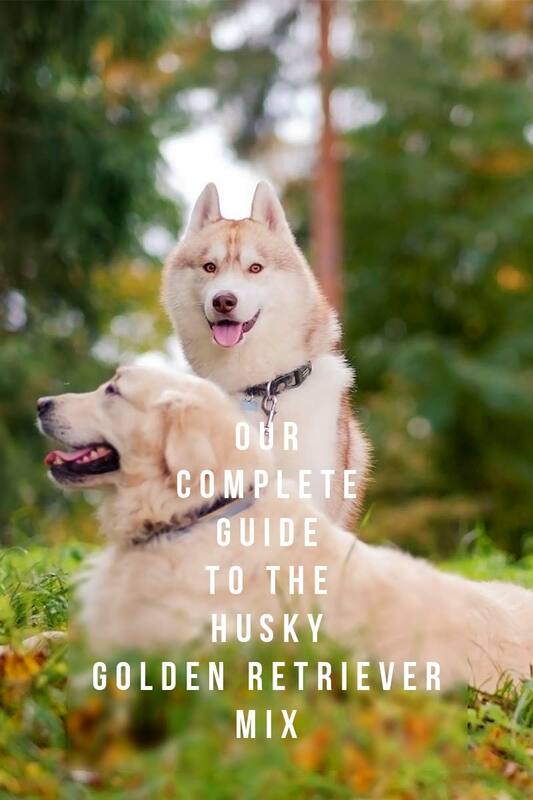 Knowing the history of the Husky and Golden Retriever can be useful. However, for a thorough understanding of the Siberian Husky and Golden Retriever mix, we need to look at specifics. It’s important to emphasize that a mixed breed can inherit traits from either parent breed. Therefore, the results are far less predictable than for purebred dogs. We can, however, determine a range of possible features based on the traits of the parent breeds. Now let’s look at more details on a Golden Husky mix! Mixed breed dogs are getting more and more popular. With each new mix, a new name (or several) is required. Most of these mixed breed monikers are derived as “portmanteau” names. This means that the mix name is made up of parts of the parent breed names, put together. These are usually easy to understand. “Goldendoodle” is a prime example. The name for a Golden Retriever Husky mix may raise a few eyebrows, however. How on earth did the Golden Husky end up being called a Goberian? However, once you realize that the “berian” part comes from “Siberian,” it all makes sense! Goberians are unusual for having a portmanteau name that genuinely makes the mix breed sound as though it’s a breed all on its own! The Siberian Husky and Golden Retriever have similar heights, so the possible height range for a Siberian Husky Golden Retriever is pretty narrow. According to the American Kennel Club, the average male Siberian Husky is 21 to 23.5 inches tall, while a female is 20 to 22 inches. The average male Golden Retriever is 23-24 inches tall and the average female is 21.5-22.5 inches tall. You can expect male Golden Retriever Husky mix puppies to grow to between 21 and 24 inches tall. Female Golden Retriever Husky puppies should grow to be between 20 and 22.5 inches tall. Despite their similar heights, the two dogs have very different frames, so their weight and build have a larger possible range. A male Golden Retriever generally weighs 65 to 75 pounds. A female typically weighs in between 55 and 65 pounds. The Husky’s light frame is practically petite in comparison. A male Husky weighs between 45 and 60 pounds, while a female can weigh between 35 and 50 pounds. Male Husky and Golden Retriever mix puppies can, therefore, grow to weigh anywhere between 45 and 75 pounds. Female Golden Husky mix puppies can grow to weigh between 35 and 65 pounds. See what we mean by less predictable? 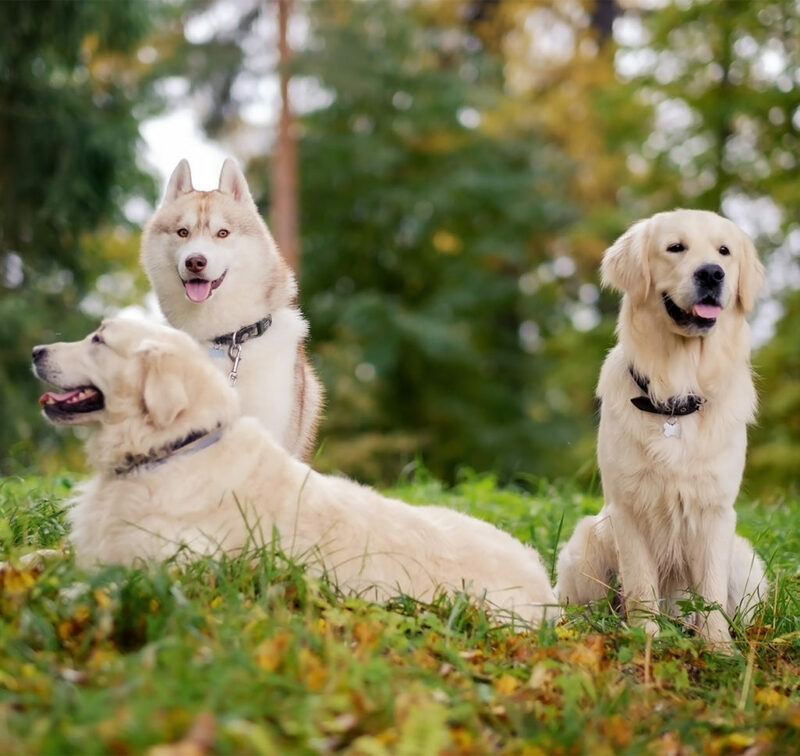 The Siberian Husky and the Golden Retriever each have characteristic coats. However, they do have enough in common that certain traits occur. Both the Husky and Golden Retriever have medium length, water-repellent double coats that shed seasonally. You can expect the same from your Golden Retriever Husky mix. That said, there are also some distinctive features of each breed that your Husky mixed with a Golden Retriever may inherit. The Siberian Husky has a thick coat, which keeps it warm and protected in the frozen North. The undercoat is soft and dense when the weather is cool, but may virtually disappear during shedding season. Well, from the dog at least. Husky owners may find the shed undercoat spread around their home. Other possible but non-standards colors include pure black, brown, or tan, as well as a variety of combinations of these colors. Golden Retrievers can have a straight or wavy beautiful blond coat. This creates a ruff around the neck and feathering on the legs, tail, and underside of the body. The breed’s golden color can range from almost white to darker coppery tone, but feathering is often lighter than the rest of the coat. Husky cross Golden Retriever puppies have diverse appearances, but what about behavior? 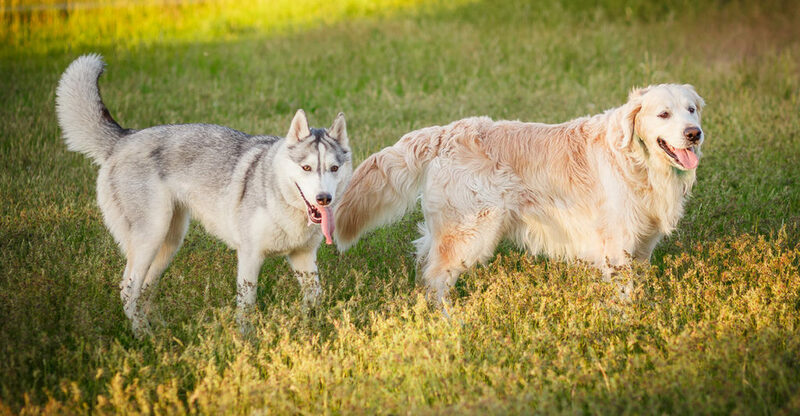 There are several personality traits that the Husky and Golden Retriever share. We can also expect to see these traits show up in Golden Retriever Husky mix puppies. Both the Siberian Husky and Golden Retriever are outgoing and social, and neither breed tends toward aggression. Don’t expect a Husky mixed with Golden Retriever puppy to grow up to be a good guard dog. The Golden and Husky mix tends to have a strong prey drive and must have supervision around small animals. However, they get along great with children and other dogs. A Golden and Husky mix is too social to be left alone for long periods of time. A lonely Siberian Husky x Golden Retriever may misbehave to ease their anxiety and boredom. One way to prevent separation anxiety and socialize with your Golden Retriever mixed with a Husky is through exercise and training. Golden Retriever cross Husky mixes need lots of exercise. Huskies are bred as endurance runners, and a Husky allowed to run loose will run until it can’t anymore. Goldens, however, were bred to aid hunters and enjoy long walks and playing outside. Fetch is a great way to exercise your Golden Husky mix, especially if you can play in a fenced in yard or dog park so the dog can run more freely. A Golden Husky mix also makes a great companion for runners and hikers. Avoid exercising in the heat of the day, however, so the dog doesn’t overheat. Of course, adequate exercise can help prevent bad behavior, but basic obedience training is key to ensuring any dog is well behaved. How can a Siberian Husky and Golden Retriever mix, or any dog, know what’s expected of them if their owner doesn’t take the time to show them? Fortunately, both the Husky and Golden Retriever are intelligent people-pleasers, so a Golden and Husky mix should be too. In fact, your Golden mix Husky will probably relish the opportunity to please you! Clicker training and other positive training methods work especially well on Husky Golden Retriever mixes. For more specific training, check out our guides to crate training and potty training. Though mixed breeds tend to be healthier than pure breeds, health problems can still occur. As with other traits, there are no guarantees. But one way to get a good idea of what your Golden Retriever Husky mix might face healthwise is to check into the backgrounds of the parent breeds. According to a survey by the Golden Retriever Club of America (GRCA), the most common health issues faced by Golden Retrievers are hot spots, neoplasia (cancer), and allergies. Hot spots are often the result of the dog biting, licking, and scratching due to another medical issue or poor grooming. These are prevented and controlled by regular grooming and treatment of the underlying medical condition. Fleas are the most common allergen for Golden Retrievers. Flea allergies are best controlled with the regular use of flea preventative treatments. All dog owners should use these as standard to prevent the diseases that fleas and other parasites carry. In general, allergies are managed by avoiding the allergen when possible and through the use of various medications. On the other hand, cancer is the cause of death for 61% of Golden Retrievers according to the GRCA. By comparison, no other disease accounts for more than 10% of Golden Retriever deaths. Other serious illnesses include hip dysplasia and hypothyroidism. Hip dysplasia refers to an improperly formed hip joint and is one of the most common medical conditions among dogs. Hip dysplasia is congenital and is detected by an x-ray. It can be managed with medication and lifestyle. Hypothyroidism is the underproduction of hormones by the thyroid. This can cause skin irritation, hair loss and other coat problems, susceptibility to infections, lowered activity, and weight gain. Hypothyroidism is caused by inflammation or shrinkage of the thyroid or, in very rare cases, thyroid cancer. It can be detected via a blood test and is treated with oral hormone replacement. The most common health problems among Siberian Huskies include epilepsy, cryptorchidism, hypothyroidism, and various vision disorders. Epilepsy is a genetic disorder characterized by repeated seizures not triggered by a particular cause. The correct medicine can control the seizures. Owners of dogs with epilepsy should discuss with their vet how to respond to seizures. This can prevent the dog from harming itself or someone else. Cryptorchidism is the most common congenital development defect in dogs. According to the Siberian Husky Club of America (SHCA), it affects 14 percent of male Huskies. Cryptorchidism is the retention of one or both testicles. This can lead to malignant growths or spermatic cord torsion in the affected testicle or testicles. These conditions can be very painful for the afflicted male and may have negative effects on fertility. The SHCA recommends against breeding affected males. Vision disorders that commonly affect Huskies include hereditary juvenile cataracts, corneal dystrophy, x-linked progressive retinal atrophy, and glaucoma. Hip dysplasia can also occur, though it is very rare. It affects around two percent of Siberian Huskies according to the Orthopedic Foundation for Animals (OFA). As you can see, there is little overlap in common health conditions between the Siberian Husky and Golden Retriever. This is good for Siberian Husky Golden Retriever mixes in that, with the exception of hypothyroidism, the likelihood of inheriting any one particular health problem is lower. The flip side is that there are a greater number of inheritable health problems. Hypothyroidism, in particular, is a possible issue for Siberian Husky Golden Retriever mixes. A Golden Husky mix may live between 11 and 14 years on average. So how does one care for the Goberian’s beautiful coat? A Husky and Golden Retriever only needs occasional bathing and should be brushed a few times a week. That is, unless it inherits that famous Husky shed. Siberian Huskies are notorious for their shedding during the spring and fall. They must be brushed daily during these seasons, and so will any Siberian Husky Golden Retriever mix that inherits this trait. One other thing to note is that Huskies needs a relatively small amount of food for their size. Goldens have a large appetite and can be prone to obesity, which can be dangerous for a Husky. Your veterinarian can tell you how much you should feed your Siberian Husky and Golden Retriever mix. That’s a big question, but we can start to answer it by reviewing what a Golden Retriever Husky mix needs. These are social and energetic dogs, so they need a family to match. This could be an athletic couple or a family with energy to match the dog’s. These dogs need lots of socialization and exercise. If everyone in your home works long hours or can’t help the dog exercise, perhaps another breed would be a better choice. If this description sounds like your home, however, the Siberian Husky Golden Retriever mix may make an awesome new addition to your family! We always encourage potential owners to consider rescuing a dog. Rescuing an adult Golden Retriever Husky mix in need of a good home is good for both of you! Your new friend has somewhere to go, and you get the benefit of the love they’ve been waiting to share. Rescuing from a shelter also tends to be cheaper than buying from a breeder. If you’re interested in rescuing an adult Goberian, check out our rescue links. On the other hand, puppies are an awful lot of fun! Obviously it’s important to choose a healthy Siberian Husky and Golden Retriever mix puppy. How can you know if a breeder’s puppies are healthy? A reputable breeder will have undergone veterinary and DNA checks to ensure that their puppies are healthy. Both parents should be certified by OFA. You’ll also want to ensure that the breeder is breeding dogs in a happy, healthy environment. You should be able to meet the mother and, if present, the father. The parents and all members of the litter should appear happy and healthy. The mother should be either a pet or a working dog, not simply kept to serve as a dam. The GRCA and the SHCA both recommend that the mother should be at least two years of age before breeding. Make sure to avoid puppy mills and other disreputable sources such as pet stores. Reputable breeders should give you any information about the dogs that you ask for, and should health test their breeding stock. The cost for Golden Retriever Husky puppies varies from $250 to $1500. So why so much variation? Location, the pedigree of the parents, verifiable health history, and how aggressive a businessperson the breeder is are all factors here. Oh, and remember how we talked about the huge variety of possible coats and colors? That plays a big role, too. For example, many people looking for Husky and Golden Retriever mix puppies want one with blue eyes and a blonde coat. Fewer of these puppies are born. That doesn’t mean that the right Goberian puppy for you is going to be impossible to find, of course. In fact, check out our puppy search guide for more tips. Caring for a vulnerable Golden Retriever Husky mix puppy is a big responsibility. You’ll find them listed on our Golden Retriever Husky mix puppy page. For more reviews and recommendations for the best products for your Golden Retriever Husky mix, check out our review pages. Likely to be very active! But what if you’re looking for something a little more similar? 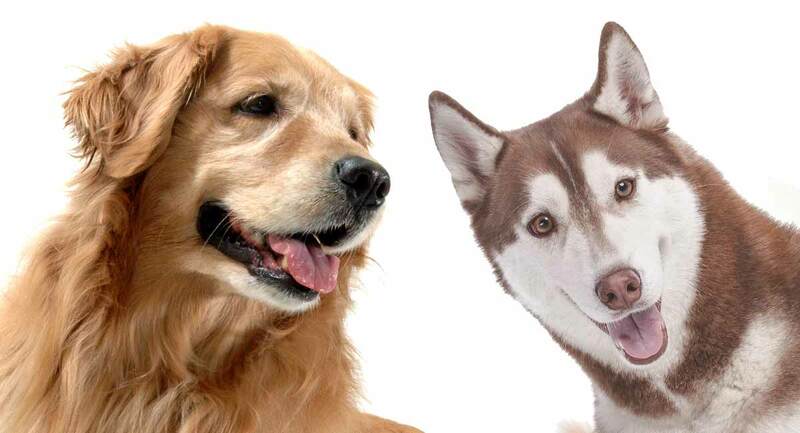 Do you know of other rescues that specialize in Goldens, Huskies, or in mixes of either breed? Let us know in the comments!